When it comes to foreign languages, Thai usually isn't the first choice on the minds of most language learners. Many are drawn to the more popular Asian languages such as Japanese or Mandarin. However Thai might be more popular than most realize. There are over 20 million native speakers of Thai (most of which are in Thailand). Thailand itself has a booming tourist industry with loads of beautiful beaches, cultural and historical spots, as well as modern amenities. It's no wonder that the language has it's own dedicated following. If you're curious about learning Thai then you've come to the right place. In this article we list our top three picks for Thai language courses. But before we get into our list it's probably best if we first discuss what exactly makes a good Thai language course. What makes a good Thai learning program? Like many of its Asian language counterparts, Thai is a tonal language. In Thai there are total of five tones (similar to pitches). In Thai, changing the pitch of a syllable or vowel changes the meaning of a word. To native English speakers this is a foreign concept, and one of the biggest hurdles you'll face while learning the Thai language. A healthy dose of listening and speaking practice is the best way to get a handle on the tones. A good Thai program will help you work through the tones one by one so that you can be comfortable with the phonetics of the language. Good native audio is a must for a Thai language course! Unlike Mandarin,Thai uses a written alphabet. The alphabet is largely phonetic, meaning that words are spelled as they sound and vice versa. Still, here are some challenges when learning the Thai alphabet. The script is totally different, so don't expect any letters to look familiar to you. There are also way more letters in Thai than you're use to. In fact in Thai there are 59 letters (compared to the 26 in English). Being able to read and write in a foreign language is a huge boon to your learning success. It opens up an entire world of media and literature for you to engage with. A good course will expose you to the written language sooner rather than later. Every language can be broken into four distinct parts: reading, writing, speaking, and listening. In order to be proficient in a foreign language you'll need a solid grasp on each one. This is because each aspect plays into the other three. It's easier to remember a word that you've read, written, heard, and spoken. Language programs that only emphasize one or two of these aspects shortchange students. 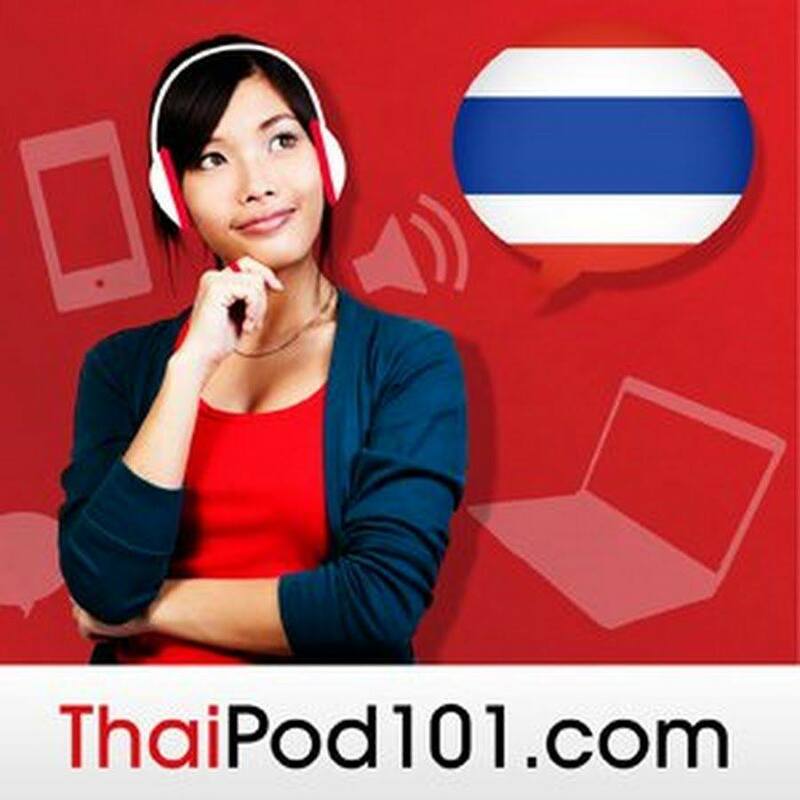 Thaipod101 features audio lessons in a podcast format. Lessons are great for grammar and vocabulary. Each lesson is built around a Thai conversation between native speakers. There are also two teachers featured in each episode and they do an excellent job of keeping things engaging. Because the course is built around audio recordings of native speakers, it's a great way to get familiar with the tonal system. There's even a slow playback feature which allows you to slow down the pronunciation of words. The site also provides transcripts, an in-site flashcard system, and many other useful features, so it's more than just a simple audio course. With this course you will read, write, and listen with the Thai language. Pimsleur is probably the second most popular language course behind Rosetta Stone. Pimsleur is an entirely audio based program and is specifically designed to develop your conversational skills. They use a unique and effective question/recall/respond technique to get you on your feet in your new foreign language. With Pimsleur You'll learn a limited but functional vocabulary and have a good sense of pronunciation. In fact pronunciation is one of the areas where Pimsleur really shines. Each word is broken down syllable by syllable, so that you here the individual sounds that make up each Thai word. The course will also draw your attention to the different tones and how they're produced. No other audio course has the thorough focus on pronunciation that Pimsleur does. The main drawback of the course is that little to no attention is given to reading or writing in Thai. What better way to learn a foreign language than with your own personal native teacher? If you have any experience with online learning, then the odds are that you've heard of Udemy: the site that allows qualified teachers to create online courses for everything from gardening to computer programing. Well it turns out the site also hosts a great foundational Thai course created by Thai teacher Jantawee Supha. She does a great job of introducing students to the foundations of Thai pronunciation (think tones), grammar, and the alphabet. Jantawee works hard to help you lay a firm foundation in the language. The course also includes exercises, flashcards, and other materials to help you on your learning journey. Thai isn't the easiest foreign language to learn for native English speakers, but don't let that fool you into thinking it isn't worth the effort! Fluency in Thai is a distinct possibility for any learner who is dedicated and willing to put in the consistent effort to learn. That being said, the right learning program also goes a long way toward helping you reach your learning goals. Hopefully this article narrowed the field of options and helped you find the course that's right for you! Coffee drinker, language learner, habitual traveler, taking life one beautiful day at a time.